Brighten up your kitchen with this lovely Tea party print. 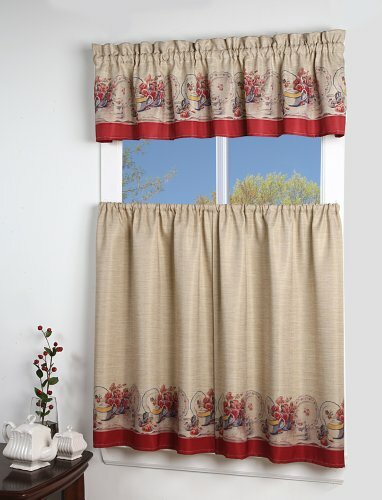 Each set contains one tailored valance and two 36" tier curtains to complete your window. Machine washable. 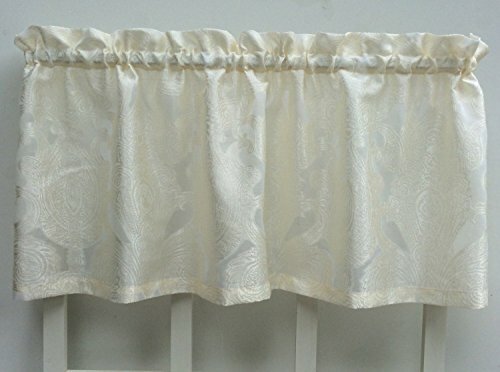 A traditional straight tailored valance, with burst of sheer elegance, will add style to your decor. Kendal brings the outdoors indoors with perennial style! 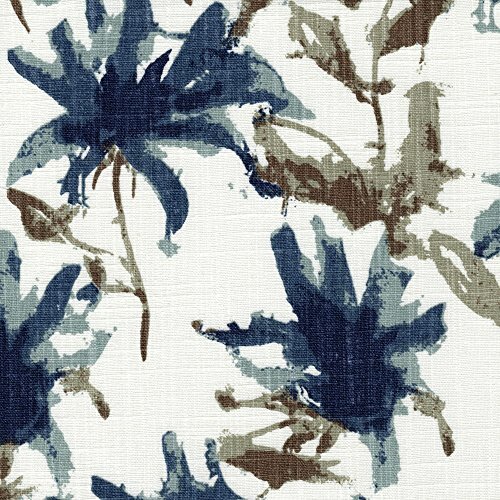 This cotton slub canvas features a bold, beautiful and breathtaking watercolor floral in dark blue, spa blue, brown, and khaki on a white background. Includes one scallop valance, lined. May be used alone or as a filler with the empress swag valance. Total Size is 52" wide x 17" long. Length is measured from the top of the rod pocket to the bottom edge. 3" rod pocket, 2" header, 3" hem. THIS IS A CUSTOM ORDER. PLEASE ALLOW 1-3 WEEKS FOR SHIPPING. Coordinating patterns in the Collection: Kendal Regal Blue, Alyssa Regal Blue, Bird Toile Regal Blue, Hexagon Regal Blue, Stella Regal Blue. FREE fabric swatch... A fabric swatch will allow you to see the color and texture of the fabric before you buy. To request a free swatch, send us an email with your mailing address and the fabric you would like to see. About us... Our bedding, window treatments and home accents are custom made in the USA in our sewing room by skilled craftsmen who have over 40 years of experience and take great pride in their work. You will be impressed by the superior construction of our products and attention to detail. Please contact us if you have any questions. 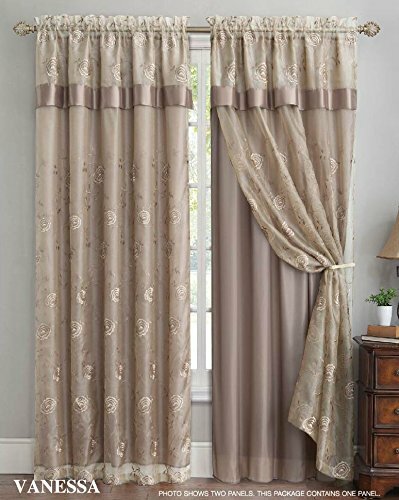 This Taupe double layer window curtain panel with attached valance will bring an elegant look to any room. All pieces are stitched together for easy setup. The front panel is made of shimmering sheer fabric that features a lovely Beige and Taupe floral and leaf embroidered pattern. The back panel is made of silky semi sheer solid Taupe fabric . 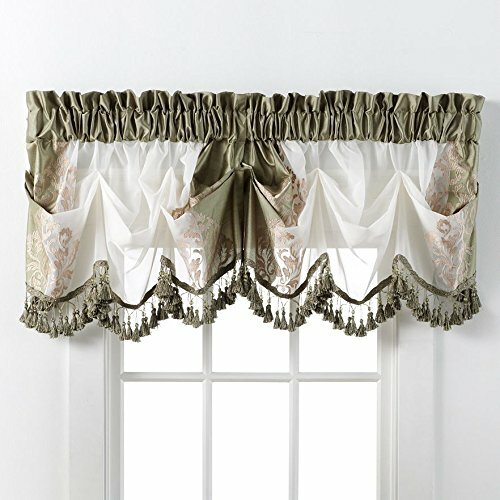 The valance is a 16" shimmering sheer fabric that features a lovely Beige and Taupe floral and leaf embroidered pattern with a 3.5" faux silk Taupe border. 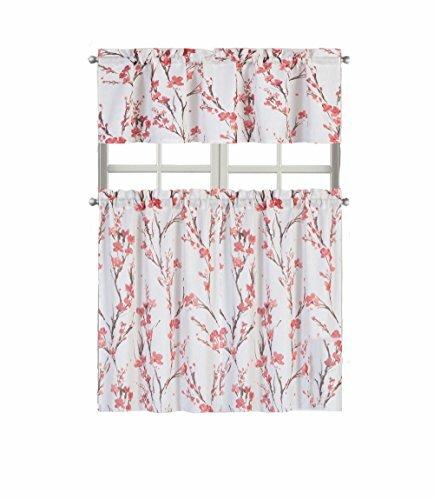 This double-layer panel provides plenty of privacy but you can also tie the back layer during the day to expose the top sheer curtain and allow more sun to come in. One Panel only. The set-up picture shows two panels, this ad is for one panel only. Hang two or more panels for optimal coverage and desired effect. For proper fullness panels should measure 2x the width of the window frame. Please measure your window first before ordering! Bring a new look to any room with this updated botanical print in shades of Blue, Gray and green on an ivory colored textured Crepe background. Gently filtures light. Rod pocket top. Available in window panels and matching waterfall valances. Easy care machine wash and dry. 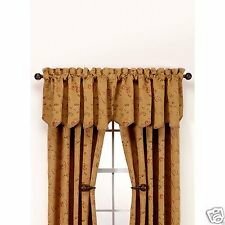 Looking for more Regal Floral Valance similar ideas? Try to explore these searches: Oral B Vitality Sonic Rechargeable Toothbrush, Diesel Stainless Steel Bands, and Mikasa Rubber Soccer Ball. Look at latest related video about Regal Floral Valance. Shopwizion.com is the smartest way for online shopping: compare prices of leading online shops for best deals around the web. 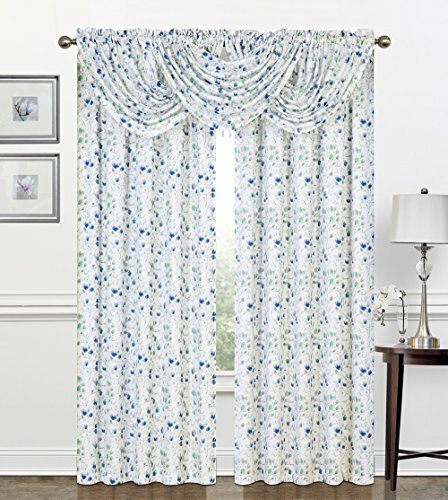 Don't miss TOP Regal Floral Valance deals, updated daily.